Our daughter has been as First Presbyterian for 2 years now and we love the school! Our daughter is thriving and learning everything from basic manners and directions to the alphabet and how to spell and write her name. We love that First Presbyterian uses the Letterland curriculum so that she will be even better prepared for Kindergarten! Also, my personal favorite about First Presbyterian is the music. Each year the school produces two amazing shows and they are nothing short of impressive! First Presbyterian Mooresville Preschool is wonderful! There are many different options available for families that want to have some more control over the number of days their preschooler is in school. The director is very accessible and knows all of the students and families by name. The teachers are warm and welcoming and very supportive. The curriculum is developmentally appropriate and offers opportunities for students to be challenged academically, if needed, but also sees the value of more unstructured play. I have seen a lot of growth in my son over the past 2 years, and I believe it is due, in part, to the great experiences he has at First Presbyterian Mooresville. I would recommend this preschool to any of my friends. Our family absolutely LOVES this preschool! My older daughter just turned 4 and this is her second year here! Next year my younger daughter will be entering the 2 year old program and she can’t wait! The staff is amazing , I can’t say enough wonderful things about all of them, especially Mrs. Lori, the preschool director! My daughter tells me about everything she learns and can’t wait to show me all of her work and I am so impressed! I know both of my girls will be fully prepared when they enter kindergarten! "The teachers at Frist Presbyterian Preschool make you feel like family! Our daughter was very shy and in no time at all, she became a social butterfly! Her vocabulary exploded beyond measure and her love for learning soared. All thanks to these wonderful women! We cannot thank you enough for loving our baby as one of your own!" "As an educator, I knew choosing the right preschool for my child was an important decision. I couldn't be HAPPIER with Mooresville First Presbyterian Preschool. At the preschool, my son has rich and meaningful opportunities to learn, play, socialize, sing,create and grow through God's love! I have watched my child change from a timid, clingy little boy to one filled with confidence and curiosity. Enough good cannot be said about the staff that work their as well. They are amazing. They are patient, caring, organized, warm and welcoming. My son loves going to preschool, and can't wait to come home and tell me all about his day and what he has learned. They have managed to instill in him a love for learning before he begins elementary school, and for that I am most thankful!" "First Presbyterian Church was my first and only choice when it came to preschool for my children. Being from the area, I knew that the preschool has been a pillar in the community for many years and that my husband and I could count on the preschool to provide our children a safe and loving environment to learn and grow in. The staff is wonderful and most remain year after year so our children have been cared for and taught by the same teachers even though they're years apart. My children have truly loved going to First Presbyterian Church Preschool and it's been a pleasure to be a part of their preschool family." "Being new to the area, it was daunting to make decisions regarding the care and education of our young children. Thanks to the overwhelming positive recommendations from friends and acquaintances, we chose First Presbyterian Preschool for our 2 preschool-aged children. We are so pleased with the quality of the staff and genuine care they show to the children. And we couldn't be more happy that they are teaching the Letterland curriculum. It's going to give my rising kindergartener a great head-start." 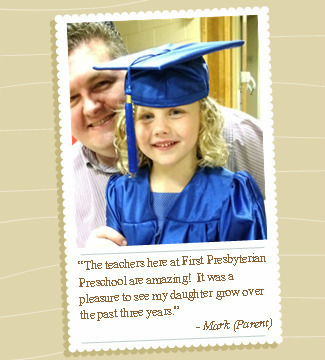 "Mooresville First Presbyterian Preschool has been such a blessing for our family. We had our kids in other schools and it was a daily battle of “I don’t want to go to school”! We were fortunate to be able to enroll our kids at First Presbyterian Preschool and there was a complete attitude change! Our son yells, “School was awesome!” and comes home with a big smile. Our Kindergartener asks if she can go back! We have an up and coming student and the teachers all go out of their way to say hello to her so when she starts school, she will already be familiar. It is not only a loving environment, our kids are loving learning! On another note, our son has Celiac disease (must be 100% gluten-free). We had him at other schools and he was constantly getting exposed, despite meeting with them. When we started at First Presbyterian Preschool, we met with the school and their response was amazing. Items in the class were replaced with gluten-free and his teacher even went as far as to research Celiac disease! We have never been made to feel like his Celiac disease is an inconvenience. Since starting here, his exposure has been nothing! It is hard enough being a working parent, but to know your kids are in such a loving environment and learning, makes it so much easier! We look forward to continuing to be a part of this family!" 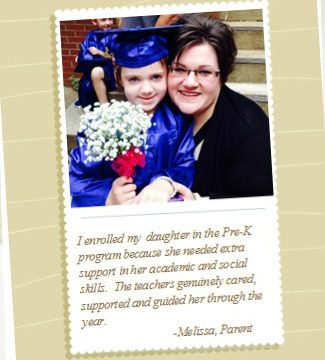 "I enrolled my daughter in the Pre-K program because she needed extra support in her social and academic skills. The teachers genuinely cared, supported and guided her through the year. I am confident she will succeed in Kindergarten after receiving such a good foundation here at First Presbyterian Preschool." "I feel so lucky that my son was able to attend this preschool! What a change he made in the Pre-K class; I could not ask for a better prep class for Kindergarten! Mrs. Jennifer and Mrs. Tricia are amazing and he learned so much that at his Kindergarten Testing the teacher asked us what preschool he went to because he was beyond prepared for kindergarten. I told her, "First Presbyterian." She said, "Of course, we know when a child comes from there, they are always the most prepared!" We are so blessed and fortunate to have found this preschool and are excited to have our daughter start as well! I am also one of those parents who had A LOT of questions and it was nice to have Mrs. Lori (the director) there who never got frustrated and would always kindly take my calls or e-mails with grace and help me with whatever I needed." "The best preschool! I love the experience my son had and love getting to see my daughter have her special time there now, too. It's not only tons of fun, but so educational, spiritual, and gives them the confidence to be independent. The entire staff is phenomenal and truly love those kids"
"This Mimi could not ask for a better group of individuals that really care! Your devotion and love and inspiration does not go unnoticed!" "We love first Presbyterian preschool!!! My daughter loves school days and is so happy and excited when I pick her up! Ms Lori is a wonderful director and her teachers are the best. She loves them and tells me how well they take care of her! I'm so thankful for such a great preschool!!" "My daughter attended her last day at First Presbyterian on Thursday. I ran every scenario I could possibly think of before telling Miss Lori that we had to change schools. This was my daughter's first year in a pre-school of any kind. She started just before her 4th birthday. After meeting Miss Lori and touring the school, I canceled all of the other tours I had set up. After Myrna's first day, I knew we had made the right choice. She adored Miss Sonda and Miss Tricia. She had "arranged" a play date with her new friend by the end of the second week. They had Farm Day, Professional Day, a Thanksgiving Feast, an adorable Christmas program, and Pajama Day, to name a few. Myrna was only ever unhappy when she would wake up and find out that it wasn't a school day. She brought home school work every Thursday. She was just so proud of herself, and couldn't wait to tell me how Miss Sonda and Miss Tricia praised her for a good job. Miss Lori communicated with us constantly via e-mails, so we never missed anything important. Myrna learned Bible verses, and the coolest thing was when she stopped to pray for her hiccups to go away. We need full-time school hours now, but I wish we didn't have to leave. The teachers are kind and supportive, and the director is the type to dress up in full Dr. Seuss gear, complete with painted whiskers. Miss Lori greets us every morning and waves goodbye every afternoon. First Presbyterian has an affordable, diverse, Christian-based program, and I am so grateful that it was recommended to us. My daughter will transition well because this school has helped her blossom in ways that even I didn't expect. Myrna loved being a Duck, and her daddy and I loved everything about our experience with First Presbyterian."